I am injecting drivers from HP into my Windows 7 automated installation. As the machine boots up, a window pops up that says "Windows can't verify the publisher of this driver software" and gives the option to "Install this driver software anyway." Is there a way to temporarily disable the driver signing check temporarily? I must automate the image process without any user interaction. Are there settings that I can apply in the Unattend.xml file that can accomplish this? Any suggestions would be helpful. Thanks! To bypass verify, we need to set the value to 0 (Ignore) use the following command. It can be referred when you create the xml file. Thank you very much for the reply! I am drastically changing my deployment process, so I'm not sure if I'll have to implement this yet, but it's great to have it. It will no doubt come in handy in the future. 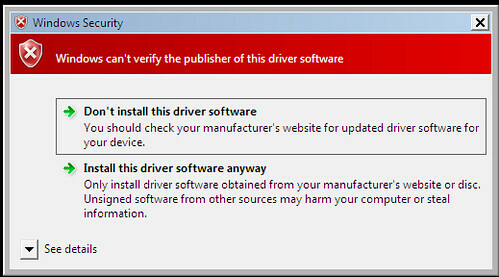 I have the same requirement where I need to bypass the driver signing warning in Windows 7. I tried the above given fixes, but none helped yet. Same here. None of the fixes proposed all over the internet work i.e. none of them works on Windows 7. Ok, I worked all weekend figuring this out and I think I have it now. I am not geeky, but very intuitive...I tested it across 4 different platforms successfully. 2 different desktops...and 2 different laptops. Here is how I did it. 3. Place the UAC Raise.bat and Driver Signing On.bat files in the sysprep folder. Sysprep your image as normal using oobe. I'm trying to install 50 print drivers on a Windows 2008 R2 RDS. 6 of them prompt for driver signing. I've tried your instructions and this does not work. Do you have any special tips for Windows 2008 R2? No one has a solution posted for this. !!!!!!!!!!!!!!!!!!!!!!!!!!!!!!!!!!!!!!!!!!!!!!!! FOR ALL PEOPLE !!!!!!!!!!!!!!!!!!!!!!!!!!!!!!!!!!!!!!!!!!!!!!!!! Todo lo anterior debería ser funcional, pero si luego de hacer todo eso no logran quitar elegantemente ese molesto mensaje, solo les queda hacer lo siguiente y que les tiene que funcionar SI o SI. 1. Descargar e instalar: ApplicationCompatibilityToolkitSetup.exe 12.0 MB, dentro de este viene una herramienta que se llama Compatibility Administrator que es la que se va a usar. 2. Una vez instalado iniciamos Compatibility Administrator. Nota: la linea anterior por si el programa que está dando el mensaje es un fichero.msi, si ese un fichero.exe, se debe dar entonces la ruta: \\ruta_de_mi_fichero\fichero.exe o usar el boton Browser para localizarlo. 10. Save, poner un nombre al fichero.sdb y a la base de datos, puede ser el mismo. 12. Install, puedes ya cerrar este programa. 13. Intenta instalar el programa o driver que te estaba sacando el mensaje. 14. Es con mucho gusto. I tried to follow these instructions in Win7 64b and VMWare GSX Server software, but without success. 7 years!! and you saved my day :) Thank you bro!